I'm so happy, that you like my other Final Fantasy drawings so much. With this deviation I'd like to go back to my personal favourite stuff. 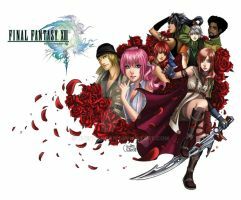 This drawing is one of my newest and favourite Final Fantasy drawings from 2011. It's also one of the hardest. There are a few others, which i consider to be tough too. But this drawing of Fang in particular was indeed very challenging. 2 years ago I always wanted to draw this picture, but I didn't. because her hair and her weapon look so complex. Anyway, now I'm glad that I took on the challenge and finished it few weeks ago. So lovely. Fang is best. a legit cover picture for a graphic novel. nice! Fang! Thats so friggin awesome!!! I keep telling myself this is the last time I'll comment on one of your works but I can't stop, they're all just so amazing! Striking character of all XIII saga. that is really good! you're an amazing artist! This looks so beautiful, you really are an inspiration for me! Would it be ok to share this on Facebook? She looks so beautiful !! Fang should be jealous of herself XD!!! *---* sorry for my english, Oh! by the way you are a talented artist!!! !! Wow. That is AMAZING. Well done! This is an awesome picture of Fang, it was definitely worth it to take up the challenge of drawing it. She is Stunning. I would like to share her in a group i started on Face Book "thoughts and feelings". I can tell that you've improved a bit more in some of your drawings looking from 2008 to now. This and Snow, and one of the Cloud ones are easily my favorites. I love your work, is really amazing! I love the detail in this sketch. It's amazing. This is absolutely amazing! What beautiful talent! Another favorite of mine. Beautiful.